Chappo1- sorry for repeating this: the slave cells DO NOT work with the Sony flashes. 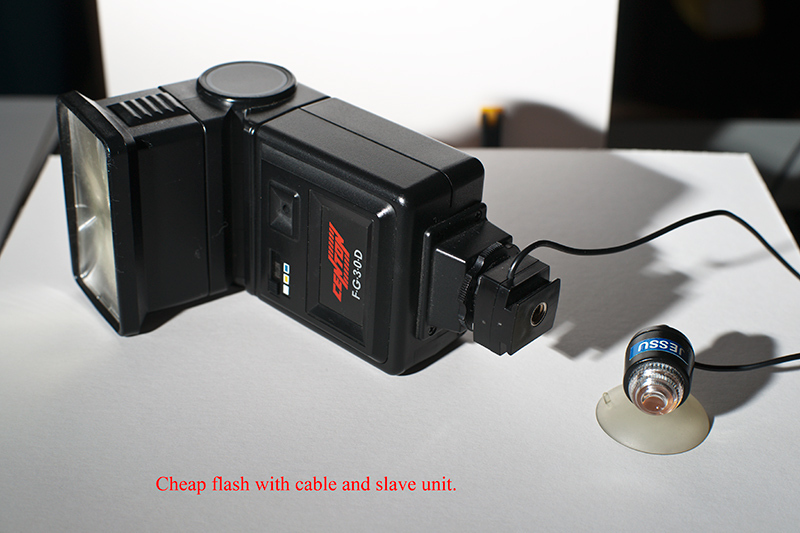 Get yourself any other cheap flash and a slave cell (costs together probably less than $25) and go and give it a try. I am going to try your patience. I have read around and re-read this thread. Why cannot I use either this or this with cable connection from the 58AM to trigger 3200i units? I know you said it cannot be done but it would help me if I knew why. I haven't looked back at the previous discussion, but I'll take a stab (at least until Stef looks in). Sony / Minolta flashes are too advanced for any other flashes. Other flashes receive a single electrical pulse to trip the switch to fire them. Whereas the Sony / Minolta system uses a kind of morse code to communicate flash strength, time, and duration. This morse code uses a main flash to communicate this to the other flashes, to you, it'll look like a pre-flash firing sequence shortly before the shutter opens. This looks like a red-eye reduction feature, but it's actually communicating. With the Minolta A9 (aka Dynax 9) you could designate which flash will fire first, designate each for how long , and strength. That camera was released in 1998-ish, and it's a feature that I think hasn't been replicated (and some have complained that other cameras haven't had that feature, though I don't think anyone here has). Anyway, long story short, you can't mix flashes, as the other flashes aren't intelligent enough to understand morse code and will fire prematurely. I have a 5400HS on it's way, which I can test once it arrives. (a) with Sony flashes you can use the wireless setting on the camera and flashes. You need to be careful which flashes you use as not all flashes can be triggered i.e. by the HVL-F58AM flash. The onboard flash as far as I can tell can pretty much trigger any Sony flash. So that's the wireless mode in connection with Sony flashes. (b) wireless with slave cells: Now here it gets interesting: (1) Some flashes i.e. the Metz one can be used in wireless mode (by setting the camera to wireless!) in conjunction with Sony flashes!!! (2) Others i.e the Centon does NOT work when you set the camera to wireless flash mode but you HAVE to set the camera to "normal" flash. Technically speaking you can buy ANY cheap flash out there. By that I mean seriously any one. I have i.e very cheap Centon ones (about 10pounds max each)/ Metz; and plenty of others. 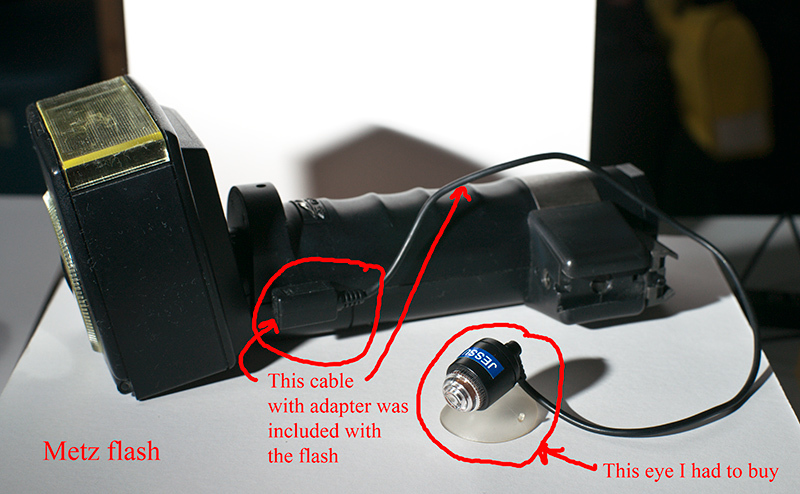 The only important thing is that you need for that either a flash sync cable that goes into a little hole in the flash or you buy yourself an adapter that you can attach to the bottom of the flash on which you then attach you slave cell. Or the newer ones see the link below don't need cables and these little eyes but are attached to the bottom of the flash. Pay attention to the Metz one: it does come with the cable but you have to buy the little so called "eye"/ "slave trigger"
My advice would be: go to the next best camera shop buy your self the cheapest flashes you can get WITH either adapter (pic below) and or cable plus "eye" and then go and experiment. The people in the shop will hopefully know what you need for your particular flash to be able to trigger it. Why Metz? Why Centon? Or indeed any other cheaper brands? The Metz flashes are usually extremely powerful - that means you need space and have to shoot through plastic bags/ diffusers particularly when shooting close ups. So if you intend to shoot a weding shoot with lot's of people and you want to illuminate whole groups of people than something like the Metz is fanastic. Also for interior architecture shots the Metz is unbeatable. Building quality of the Metz is outstanding. Not sure how often I have dropped mine- nothing ever happened. I sincerely believe you can use them as a hammer. Something that is much cheaper such as Centon flashes or anything similar is particularly useful when you are shooting close ups or just want highlights on the hair and so on. They have muich weaker output which is sometimes actually important. Let's assume you would go outside into your garage with a Metz flash and would like to shoot a moddy shot of your car with very controlled illumination? Forget the Metz- you will have to soo diffuse the flash and still your whole garage would look like it is flooded in light. or such occassions you would take 4/5/6... or more cheap flashes (all together cost you under 100 pounds) and would put them strategically around your car. They are much easier to control than one single Metz. So you see horses for courses. Now to just come back to one point above: some flashes can be used in conjunction with the Sony flashes in wireless mode which is fantastic. The other way around I don't know yet as this would mean to set the camera to "normal" flash and attach some kind of triiger to the Sony flashes. I very much assume one would have to buy an expensive trigger to be able to trigger the Sony flashes outside the wireless mode and frankly theother way around is probably cheaper- dependng on how many flashes you want to buy. I tend to buy any functioning flash that I come across and get a slave cell (Jessops has them) plus cable. Just a FYI, all that Stef has posted above is 'The Bible'. The same thing applies to your 3200i as the Centon flashes, as I believe the Metz (and some of the Nikon flashes) if triggered via optical slaves can be 'told' to ignore pre-flash (sometimes called 'delay' I think). So replace 'Centon' with '3200i', and use the Ebay adapters you posted rather than the ones Stef's listed (as they have a different mount) and you are good to go. I did see a post from a Sony user on another forum that stated they had found a optical trigger for the Sony mount that had a switchable 'delay' on/off switch, but I can't find the post. He did find on Ebay I believe. Also note that the 3200i do not have any manual settings, meaning when you do trigger them they will fire at full power which may or many not be limiting. I guess it depends on what you want to do with them. As Stef stated, if you are firing them remotely then you are not limited to Minolta flashes. I have the 'Strobist.com' DVD and they recommend the Nikon SB24, SB26, SB28 & SB80's - which I believe have optical slaves built in. The problem that I have found with the Nikon, Canon and even Metz flashes (although Metz not so much), is that the 'Strobist Revolution' are buying these up and are pushing up prices. I haven't looked that much at the Metz flash, but I was slightly put off by the physical size. They are as Stef pointed out built to last, but for me I wanted to be able to mount hotshoe flashes with portable softboxes (like the Ezybox hotshoe), umbrellas, snoots, grids etc - which are all possible with the Metz flashes but would require working out a different mount than with my 56's. Personal preference, but I like the idea that all my flash accessories are interchangeable. If you don't require this, the Metz hammerheads look very interesting. I know nothing about the Centon flashes, as in how powerful and controllable they are (i.e. what their GN is and how much they can be dialed down to reduce power). On that note that is one thing that I do find with the Sony/KM flashes, is that although they have a high output power they will only do a minimum of 1/32 power, where as some of the 'Strobist' Nikon flashes above will go down to 1/64 or 1/128 power. The way around this is to use other methods (as Stef pointed out) to reduce power, but not as quick as a couple of clicks on the back of the flash. Not that some of the very cheap flashes might only do manual down to 1/8 power. Just worth pointing out. I've been looking around and the old Minolta flashes that are not compatible with the digital KM/Sony system are dirt cheap. There was a 5400HS on Dyxum for $80. On Ebay, £20 for the old 4000AF (which used the standard hotshoe mount, but is a bit old now - and the one I got I killed!). I just picked up from a shop a 5400HS in the UK 5400SH for £65 including a warranty for 6 months. The thing that puts people off these flashes and using them off camera aka 'Strobist Style' is the hotshoe mount, which I think is keeping prices low. $80 for a GN54 flash, with full manual control, modeling light, 1/1-1/32 power - is fantastic VFM IMO. I have now got a few of the Ebay 'FS-1200' hotshoe adapters (with pc sync input) and the Ebay 'Optical Slaves' (like you posted) and these work perfectly. A few months ago before these were available I was ready to 'throw in the towel' with the Sony/Minolta flashes and the non standard hotshoe (sorry the 'Minolta standard hotshoe'), but now the FS-1200/Optical adapters are available I'm now very happy. Just one thing regarding the Metz flashes: they come with a braket that lets you mount them onto any tripod. No extra cost involved! Thanks Simon and Stef. 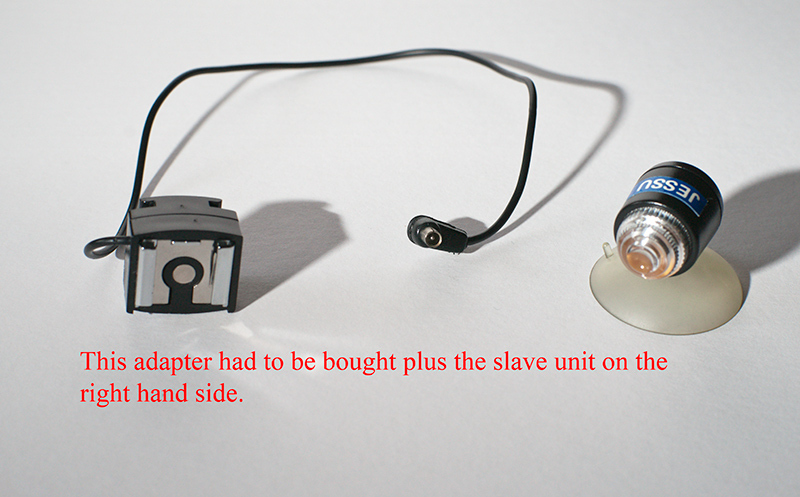 I will order the two optical slaves and give them a go as I have 2 3200i's. I am familiar with the laws of physics and light so reckon I can adjust the intensity with distance and diffusers if I can get them to fire. That's worth knowing - save a few extra $$ along the way! Not a top quality image but the light is coming from the rear minolta 3200i. Settings first and if any of the knowledgeable folk think I can do it a better way please say so. The camera (a700) is set to manual flash with the on board flash set to 1/16 and flash compensation at -3. The flash also has a piece of plastic over it to further reduce the direct light. I took a shot with the remote flash off to confirm that it was poorly lit. The synch speed of the 3200i is 1/125 so I set the camera to shutter priority and 1/125 sec and allowed it to choose aperture (f4). I then turned on the 3200i and took the above shot. Thanks to Stef, Fother and all the other contributors I have it sort of working. The clever Minolta engineers designed the flash so that if it is not triggered within 5 seconds it goes to sleep and when on board is revived by the camera. Well it is not on the camera and, unless I can come up with something cleverer than the above engineers, I only have 5 seconds after turning it on. At first I could not understand why it fired sometimes and not others. Finally I had to read the instructions !! Am I correct to say that we can't trigger 58 flash off camera in manual mode ? a700 on-board flash set to manual. 58 flash off camera set to manual. I'm trying to trigger both 58 and optical slave studio light with a700 on-board flash. In order to trigger studio light I need to put camera flash in manual mode. I have a 58AM and have just re-tested and you are correct, I cannot get it to fire with the A700 in manual flash mode. you can fire it via wireless connection. By changing the position and flash comp settings on your camera you should get a better result.